On a night where I saw OISD, Kalil Kash and a few other acts perform at Public Assembly, I had to make my way slowly back to Bed-Stuy. The G train remains to be that paper cut on your fingertip you can't avoid. If you want to go out and have a good time in Brooklyn, you will eventually be led to Williamsburg and unless you are coming straight from the city, you will need to encounter the G train, so rest assure that the MTA makes sure you will dred every second of it. As an unfortunately jerky stop at Clinton/Washington stole a goodnight kiss from an unexpecting drunk couple, I was left searching for Kid Koala unsuccessfully as Demon Days came to an end. At that time, I thought to myself, "Demon Days is a classic album"......so here we are. To understand the Gorillaz music, you don't have to be familiar with any certain musical era, you have to know about a lot of them. I've written about Plastic Beach already, but it would be a shame for anyone to miss out on Demon Days. It's an album I come back to often throughout the years. 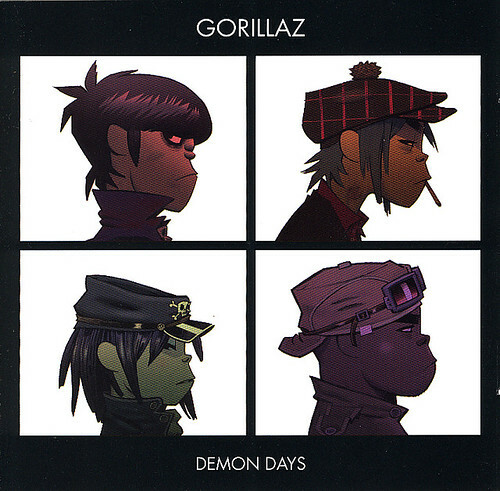 If you're strictly a hip hop head, the fact that the Gorillaz have teamed up with Mos Def, MF Doom, Opio (Heiroglyphics), Del tha Funkee Homosapien, Snoop Dogg, De La Soul and a ridiculous list of historic musicians in the past can either encourage you to listen or it can make you run for the sunset. For me, I dig experimental collaborations because I think they crack the creative door into new directions that hip hop stereotypes miss. Demon Days is that genre bending type of album I believe everyone should have or have at least given a chance at some point. The album is cinematic, off the wall, experimental, fun and musically rich. A childrens choir, MF Doom, Dangermouse, Opio from Heiroglyphics, Nenah Cherry, Roots Manuva, Ike Turner, De La Soul, Bootie Brown (Pharcyde) and a cross section of many other artists grace the tracks.